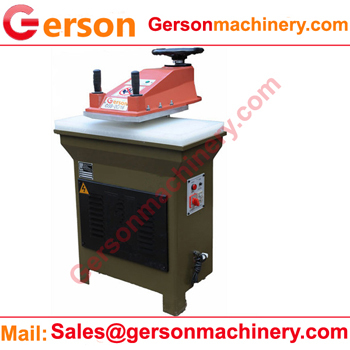 GSB swing arm die cutting machine is Gerson design and manufacturing swing arm die cutting machine which is very very porpular die cutting machine .You will see many .It is most from our factory. 1. Like our other cutting machine, which is a driven by hydraulic power at the same time, designed to meet the human body engineering, to ensure the convenience of the operation: press the button, the machine cutting work, all cutting die can used on the machine to ensure the diversity of products. 2. Each time a light beam or adjustment of the cutting head or other, can be easily pushed to a larger operating room.Simple and efficient cutting point setting.Operation with double hands. 3. Cutting area and cutting pressure can be applied to cutting a variety of materials. 4. These two pieces of paper and the volume of the material can be machine cut, even in the multi layer can also be. 5. Special specifications include long stroke, large cross-sectional area, large power, etc., can be met.